M.I.A’s Hong Kong Classics imprint (not to be confused with Hong Kong Legends, highly respected producers of the Mr Vampire disc released last issue) presents a lavish fantasy film “in the tradition of Crouching Tiger, Hidden Dragon and The Matrix” (i.e. : it has wire-assisted fight scenes). The film centres on an epic battle atop the roof of the Imperial Palace to establish who is the World’s finest swordsman (the sort of thing that probably happens every Friday night, after the lads have had a bit too much sake). 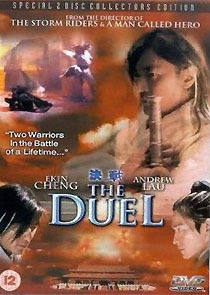 The film is actually the third film in a trilogy that began with The Storm Riders (Feng yun), but newcomers to the series will be at no disadvantage. The movie is presented in anamorphic 1.78:1 ratio, and has a surprisingly good 5.1 audio mix (in Cantonese, at 448kbps), supported by “Digitally re-mastered English subtitles” (whatever the feck they are!) A number of trailers, a stills gallery, biographies and a good, subtitled twenty-minute Making of… documentary are also offered. The set includes a second disc that offers what appears to be a very, very slightly longer “International Version”, in English, but it’s not clear what the differences are (and certainly not clear whether they merited a second disc, when it could presumably have been accommodated by an alternative audio track on the first). Picture quality on the International Version is much worse than the Cantonese version (this might simply be because Disc One is a dual layer disc, and Disc Two is a single layer disc). Aside from making it appear to better value for money than it actually is, there seems to be no reason for the International Version to be included, and M.I.A might have better spent their money on licensing the commentary track from the American disc, or on a bit of cleanup work, or on ironing out a couple of the disc’s authoring glitches.